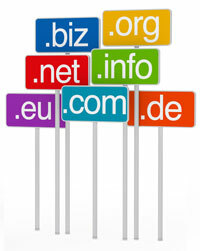 A domain name is a web address for your company's website, i.e. www.yourcompanyname.com. You need a domain name in order to have a live website on the internet. Domain names are usually renewed annually (longer tems available too) and must be paid for in advance. When you register a domain name with us, you get access to our free website builder software so you can quickly and easily build and maintain your own website yourself. Registration also includes free parking, which means web hosting fees will only apply when the website goes live. You can also manage your own DNS settings and set up URL redirects for free. Please note that email services are only provided with paid web hosting plans. If you already have an account with us (either a trial webspace or a live website), please login first and register your domain name there. You can use our search facility below to find out whether your preferred domain name is available. If it is, you will be able to register it and start building your website straight away!